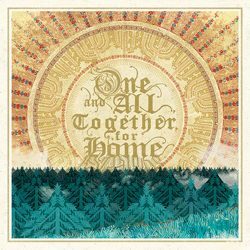 On May 23rd 2014 (May 27th in North America), Season of Mist will release a special compilation entitled “One And All, Together, for Home“. Initiated by Drudkh main man Roman Sayenko, this project consists of established bands from the metal world recording folk and mostly acoustic songs. Primordial (Ireland), Drudkh (Ukraine), Kampfar (Norway), Winterfylleth (England), Ava Inferi (Portugal), Mondvolland (Netherlands), Himinbjorg (France) and Häive (Finland) participate with with brand new, all exclusive and previously unreleased recordings. All the bands are expressively linked in their artistic output to the culture and history of their countries of origin. Therefore they represent eight regions of modern Europe and yet find common ground in the different musical traditions they explore. Each artist employs their own means to find and present their roots to the world. You will discover interpretations of traditional songs, cover versions of folk artists, or the use of themes and melodies from their musical heritage in original compositions. “The idea behind this compilation is a coming together of like-minded artists from all across Europe in an attempt to rediscover the history and traditions of their respective areas of origin; through the medium of traditional music“, explains Chris Naughton of Winterfylleth. “This compilation brings together eight artists, who have a strong historical interest and a pre-existing link to the music of their respective homelands.” “One And All, Together, for Home” will be released by Underground Activists (Season of Mist sub-label) in a deluxe 2CD digipak with gold foil print and 8-page folded booklet, numbered to 2.000 copies. I saw this news on Facebook I think. Sounds like a great compilation. I like the fact that it’s been initiated by a band and not a label.